Properly disposed deer remains will soon be taken care of by decomposition and insects because nature wastes no nutrients. Hunters should realize that improperly disposing of deer remains is not only illegal but presents a negative public image. It provides a legitimate point of criticism that can be used by people who oppose hunting. Hunters should also remember not to display harvested game where it might offend non-hunting members of the public. When transporting a deer in the back of a truck or on top of a vehicle, hunters should wrap a tarp or other covering material around the animal. This is a simple, considerate step that may prevent a non-hunter from becoming an anti-hunter. While most hunters are ethical and take the necessary steps and care in proper disposal of deer carcasses, some improperly dump remains in a creek or river, near a boat ramp, along a road, on public property or private property that is not theirs. This unscrupulous practice creates numerous problems beyond the negative image to hunters. The carcasses can cause human and animal health issues, environmental contamination and a food resource for unwanted scavenging animals. Hunters are also reminded that improper dumping of deer remains is illegal and persons involved in the activity can be cited criminally with littering. Proper handling of all parts of a harvested deer from the field to the table is an important part of hunting. Heads, hides, and entrails should be buried at least 2 to 3 feet deep so dogs or other animals won't dig up the remains and drag them around. Alternatively, hunters can take the remains to their local landfill provided the landfill accepts animal carcasses. 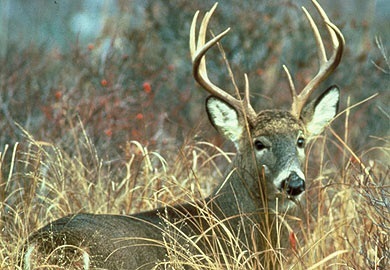 Sportsmen hunting on Wildlife Management Areas often field dress their deer but the entrails should be disposed of properly, not just left on the ground. Never, under any circumstances, should remains be thrown into streams or other bodies of water. Again, this can result in a citation for littering. Properly disposed deer remains will soon be taken care of by decomposition and insects because nature wastes no nutrients. It is part of nature's recycling program. For information on constructing a simple composter to recycle deer remains, hunt clubs that harvest large numbers of deer can contact their local Natural Resources Conservation Service (NRCS) field office or Conservation District office. Composting deer remains solves the dilemma hunters face in properly disposing of deer carcasses, and it also yields a valuable byproduct that can be used to fertilize next year's food plots. Hunters should also keep in mind that people who discard deer remains on private or public property can be cited for littering. Poor behavior by hunters like improper disposal of deer remains promotes the kind of negative image that anti-hunters use in their attempts to ban hunting. Landowners who find a mess on their property may also have second thoughts about allowing access to hunters next season. Hunters must blacklist those people who display unethical behavior such as the improper disposal of deer remains. Violators should be reported to SCDNR's Operation Game Thief by calling 1-800-922-5431. The 24-hour, toll-free number is printed on the back of hunting and fishing licenses.